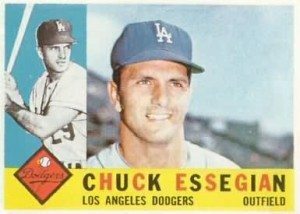 The Dodgers still make Chuck smile! Thanks to Juan Rosales for sharing his recent successes at Baseball Interactions! When I wrote to Chuck Essegian, he wasn’t exactly talkative. I shared my experiences in an earlier blog post. As proof things change, check out his memories of ball in Japan, followed by his World Series experience. Juan collected both memories. What does this all mean? Never say never. It’s possible to do your homework and choose likely candidates to ask for autographs and/or questions. However, every day is different. If you have stamps, you have hope! Thanks for the feature, Tom. Chuck seems like someone who would have a lot of great stories to tell.